Check out this golf girl’s trendylicious wardrobe to find some really cool golf clothes! Hannah is a high demanding girl. Dress her up in in 3D; You can choose from many clothes and accessories! 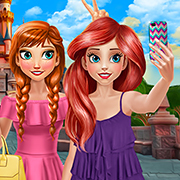 Help BFFs Anna and Ariel to take a perfectly styled selfie in front of Disneyland’s Sleeping Beauty’s Castle! Help Ellie pick a lovely flight attendant outfit for her first flight to Paris!